The lanes and hedges where their homes abide. A safe haven for the gentle soul...with the charm of an old-time resort...and front door access to our beautiful national park. Our historical bathhouse dates back to the turn of the century when a young Sulphur Springs was alive with excitement and bathhouses abounded. One of those establishments was the Caylor Bathhouse which has become the Sulphur Springs Inn Bed & Breakfast and Cottages. We offer you an opportunity to experience the serenity of days gone by when this area was known as the "Peaceful Valley of Rippling Waters" and people came from distant lands to experience the healing powers of the sulphur mud and bromide springs. Nestled in the Arbuckle mountains at the edge of the old Sulphur Springs Reservation, then the Platt National Park, and now the Chickasaw National Park, our historical bathhouse of healing waters offers our guest an atmosphere of simple elegance and an appreciation for nature. 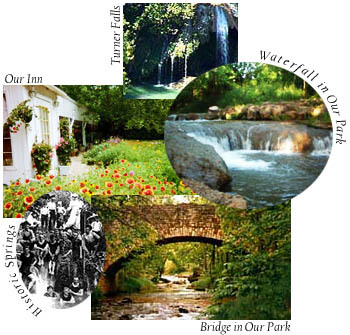 Our front door opens into Oklahoma's most beautiful and sacred grounds; affording our guests easy access to Nature's healing medicinal springs, unique flora, fauna, geological formations and abundant wildlife. As owners and your innkeepers, it is our sincere intent to provide you a brief retreat from the pressures of modern living and our desire that you leave refreshed and renewed in body and spirit. Please join us in our haven for the gentle souls.